Stainless steel is selected for their wear-resisting, heat-resisting, acid-resisting and corrosion resisting characteristics. Many different grades of stainless are used in wire cloth. T304 is the most common, but other are used in specific applications to take advantage of each grade’s unique properties. The wire mesh made of stainless steel is extensively used in mining, chemical industry, food industry and pharmaceutical industry. Our stainless steel wire mesh products are generally made of stainless steel type 302,304,304l, 316, 316l, 321 and 430 etc. We produce wire cloth in all kinds of forms. The weaving is determined according to our customers’ specific requirements, such as the material, the wire diameter, the size of the mesh, width and length. Characteristics: square aperture, high flow through, relative high open area, as result less pressure drop during filtration suitable for all kinds of filtration up to 63 µm. Twill weave: each weft wire passes over two and under two warp wires, and each warp wire passes over and under two weft wires. The wire diameter for both (warp and weft)is mostly the same. Hitesh steel manufacturing the wire mesh. Since then it has diversified into various wire - products manufactured by automatic machines manned by skilled workman and guided by a team of technical experts producing quality wire mesh and other wire products. Besides we are registered with major government department & large private sector units ranging from defence, atomic energy, electricity, iron & steel, oli & refinery, fertilisers & chemicals, cements, food-processing, plantations, automobile, engineering, mining, construction etc. We manufacture & export wire mesh. It can be made in fine apertures upto 600 mesh, while upto a maximum wire thickness of 16 mm made up of stainless steel, spring steel, mild steel, galvanized iron, copper, brass, silver & nickel wires, etc. , as per the customer’s sizes and specifications. The wire mesh is manufactured as per the bis, bss, astm, tyler & din norms & standards. They are widely used in chemical, stone crusher, fertilizers, sugar, pharmaceuticals, steel, food processing, cement, mineral, construction, etc. Hitesh steel can offer wide range of wire mesh dependents on the configuration of wire thickness in relation to aperature size, as well as type of weaves, and can vary in texture from being as fine, soft and flexible as silk to being as rigid as steel plate. 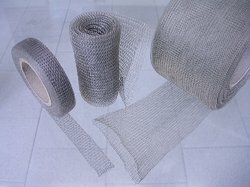 Fine wire mesh is available in rolls or in cut circles and also as fabricated filters. Hitesh steel a wide range of perforated sheets punched in mild steel, galvanized, aluminium, stainless steel and special alloys. Standard specifications can be supplied as per your requirement and dispatched within 3-4 days. Hitesh steel perforated sheet are used extensively in the engineering, food processing, building, agricultural, nuclear power and petrochemical industries and many others. Perforated materials are used in a number of different applications for a variety of reasons. Used mostly as screens, filters, shields, and guards, perforated materials can control the passage of air, liquid, light, solids, heat, electromagnetic waves, and sound waves with these abilities, perforated materials has applications such as clothes washer and dryer drums, speaker covers, automotive grills and exhaust components, airplane engine silencers, grain dryers, microwave ovens, computer cabinets, and countless others. Other applications are aesthetics in architectural and design applications such as facades, fixtures, and privacy panels. Hitesh steel stocks stainless steel perforated sheet in 304, 304/l and 316/l in multiple gauges and pattern sizes. We can also produce perforated stainless from our large inventory of stainless sheet, including grades 309, 310, 321, 347. In 400 series stainless we can supply perforated sheet in 409, 410 and 430. Hitesh steel is the most reliable source for many kind of perforated products which are directly or indirectly used by all sectors of industry like chemicals, petro chemicals, pharma, food processing, power, construction or even architectural and furniture. 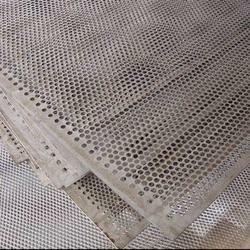 Wide gamuts of stainless steel perforated sheet are available at the most competitive prices. the suitability of our manufactured stainless steel perforated sheets with various industrial applications, made them hugely popular among clients.